Electron Technical Services Ltd have recently achieved ZyPartner status for ZyXEL Communications UK Ltd, enabling Electron to offer the full range of ZyXEL products will full manufacturer support. Representatives from Electron attended a full day training course at ZyXEL’s UK head office in Bracknell, where they were given comprehensive training on the features of the various products, followed by a written exam. 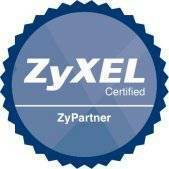 ZyXEL is the World’s largest DSL router manufacturer and Europe’s biggest WLAN equipment vendor. They have more than 2,200 employees worldwide and a global turnover of $390 million, more than 50% of which is generated in Europe. ZyXEL manufacture an extensive portfolio of products, including DSL routers, switches, firewalls, DSLAMs and wireless LAN devices and have solutions for all businesses, from SOHO to SME to large corporates.